Over the past year Neil Kennedy had been digging into his vast archive of magazine articles and sending them along to Earwigoagin. These two articles about the introduction of the plywood frame and stringer construction in the 16 footers I find particularly interesting. The 16-footers may be considered the baby brother to the 18-footers but, as Neil points out, in the late 1950's and 1960's they were developing faster than the 18-footers. The Australians (in the 16-footers, the Western Australians) were the leaders in pushing lightweight frame and stringer construction for their performance classes. 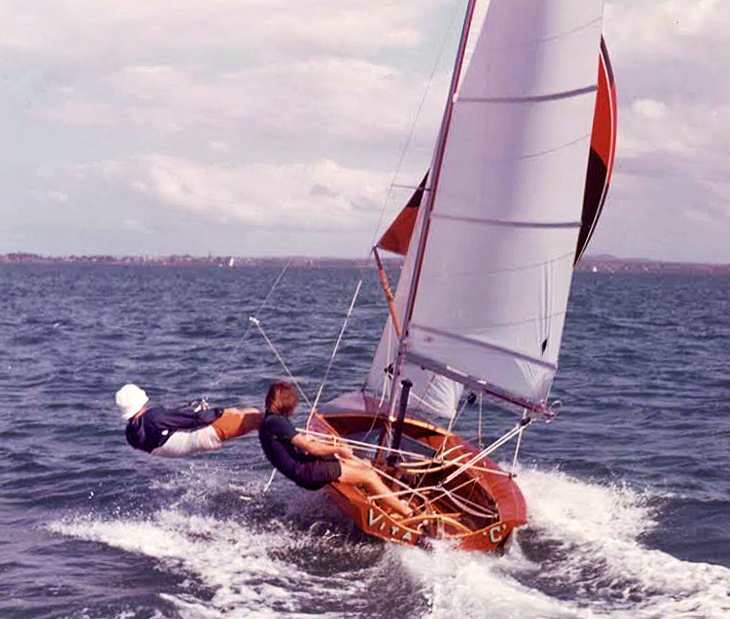 Even back in 1959 the plywood they used for the 16-footers was 4 mm., which is really light for what is essentially an open boat. As a comparison, most plywood International 14's of the 1960's (there weren't many - most were cold molded designs) used 6 mm. On Evelyn, the 16-footer, I count twelve stringers over the hull bottom (plus the center plank). You see a similar surfeit of fore-aft stringers in "Vitamin C", one of the last plywood champion 12 foot Cherubs of the early 1970's. 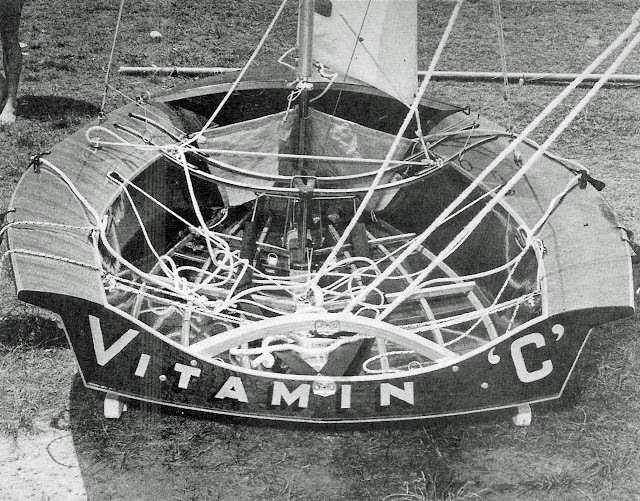 "Vitamin C" on a ripping tight spinnaker reach. The South Gippsland Classic Wooden Dinghy Regatta is over the Australia Day Weekend (Jan 26 - 28). As a kid I was always salivating over the hot-rod Australian plywood dinghies of the 1960's and I always look forward eagerly to see what sailing dinghy restorations and replications the Aussies have unearthed, to be displayed and sailed on the Inverloch Inlet on Australia Day Weekend. My report on the scow Moths in the 2016 Classic Wooden Dinghy Regatta. Earwigoagin reports on the South Gippsland Classic Wooden Dinghy Regatta. Inverloch Classic Wooden Dinghy Regatta 2018- 90 years of the Moth from drift media on Vimeo. This French engraving (I've cropped this from the whole image) is of a 1858 regatta on the Seine at Saint-Cloud. 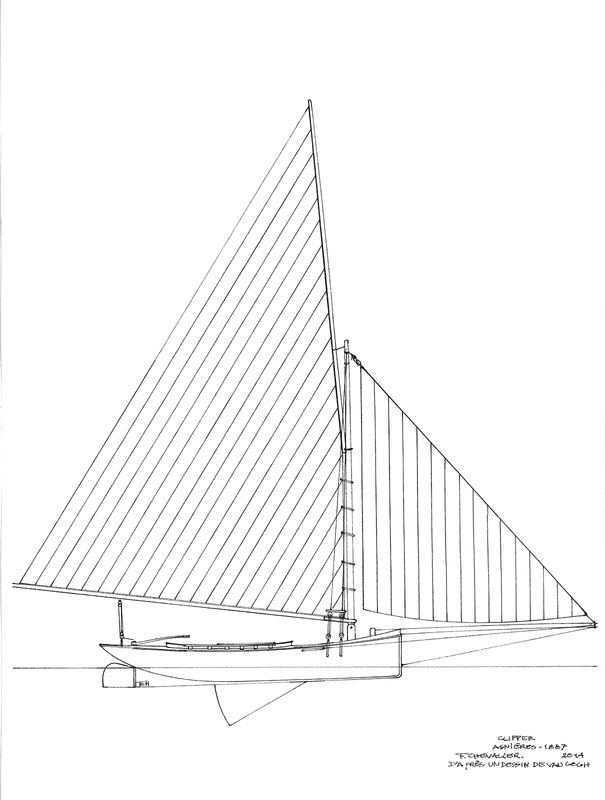 It is the oldest pictorial rendering I've come across of a full-on racing "Le Clipper Parisien", which was developed from an imported American sandbagger, and refined for racing on the rivers around Paris . This is the fleet of the larger racing sailboats (they split the fleet around a 5.66 meter length) and shows the Clipper with a good lead. Here is a profile drawing of an 1887 clipper. This is the second header photo I've put up featuring the Butterfly class. The first header photo, back in 2014, was of a turtled Butterfly. The 3.6 meter Butterfly is America's most popular small scow, found mostly in Michigan.